How did I ever manage? >These here internets are gettin’ to be pretty much integral to everybody’s life, right? I use it for as much as I can seeing as human interaction is so 20th century. The question in the title refers to how I ever managed when all I had was 33.6kbps dial-up internet. We have gotten so used to having broadband that the very thought of dial-up at even 56kbps makes me feel sick. 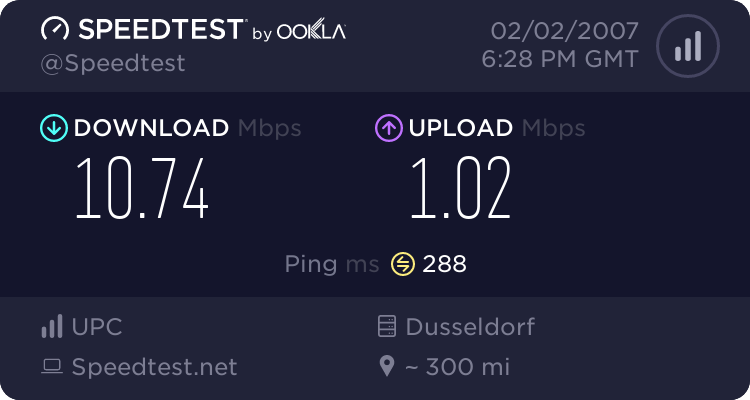 We just got an upgrade with Cablecom to 10Mbps which is blazingly fast (we had 5Mbps and I thought that was quick) and it’s CHF10 per month cheaper than my old plan – bonus. The best thing though is that there are never any download limits so I can have a lot of “traffic” over my connection and not have to worry. Try your connection and tell me how fast yours is.